This dark and moist cake goes together very quickly, using the food processor - first to shred the carrots, and then to mix the dough. It is not too sweet, and it freezes well. To serve this after a meat meal (or to pretend it is a honey cake during the Jewish High Holiday Season), we like it topped with honey frosting. 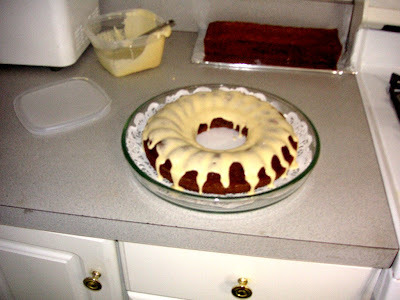 Otherwise, any traditional (dairy) cream-cheese frosting will compliment it nicely. It is excellent unfrosted, too. Instead of trying to guess the amount of carrots needed, I cheat: I scrape the skins from a whole bag of carrots, shred half, measure out the amount needed, and save the extra shredded carrots for making kishke. 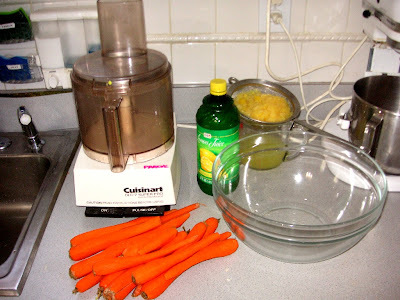 Making kishke involves pureeing a couple of carrots, so using shredded carrots doesn't affect the results. 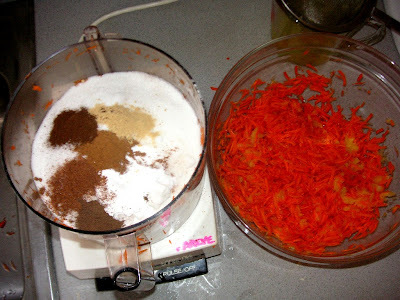 To make sure I have the right amount of shredded carrots as whole-carrot equivalents for the kishke, I weigh a couple of the remaining whole carrots, and use that amount of shredded carrot in the kishke recipe. This sound complicated, but the bulk preparation of ingredients saves much time. I'm always looking for ways to streamline the preparation of multiple concurrent recipes. Depending on the size of your food processor, this recipe can be doubled. 1/2 can crushed pineapple (6-8 oz.) 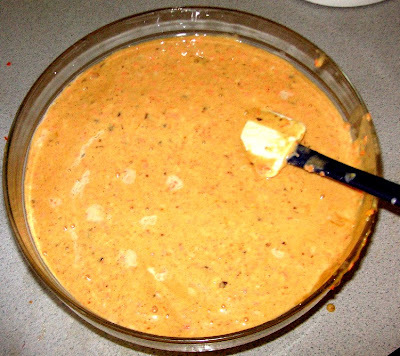 - or can puree the pineapple from chunks or rings in the food processor - well drained. Grease and flour 2 large loaf pans (9"x5"), or one smaller loaf pan (8.5"x4.5") and a bunt pan. Mix Group A items in a large bowl and set aside. Use food processor with the metal blade to mix Group B items by processing for a few seconds. Add Group C items to Group B, one at a time, processing to incorporate between each item (and each egg). Add the Group A items to Group B in the food processor, and process until well incorporated, about a minute. Pour the mixture into the prepared pans and bake at 350 degrees F for 40-45 minutes,\. Cakes are done when the edges pull away from the side of the pan, or a toothpick comes clean of batter when inserted in the middle of the cake. Thank you so much for this wonderful recipe. I made it and brought it as a birthday cake to my friend who adores carrot cake and she loved it. I went with a basic cream cheese frosting, and put the walnuts on the side of the cake (so they could be easily removed- for kids, etc). 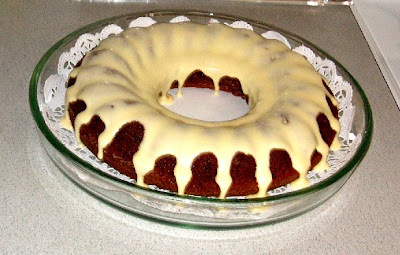 I am going to try your honey frosting next and maybe bring it to my in-laws for RH. I was going to just use a packaged version, this was so much better and still very easy (thanks to the food processor). PS it makes the whole house smell cinnarific while it's cooking.